It’s amazing how far we’ve come in designing modern, braided hairstyles since their come-back a few years ago! And this trend continues to delight and amaze thanks to the artistic talents of so many expert stylists/colorists! This gallery will inspire you to re-think everything you know about braid hairstyles for formal and informal wear. So get ready to see fabulous ash-blonde, gray, blonde-balayaged brunette and copper braided hairstyles to help you look stunning for every occasion! Liven up long hair by creating this impressive high ponytail with simple braid detail! A high, swishy pony is always a flirty option and this thick braid updates the look to a trendier style. Lovely texture decorates the back on either side of the gleaming braid. And the model’s beautiful, copper-brown hair color is very fashionable this season, too. 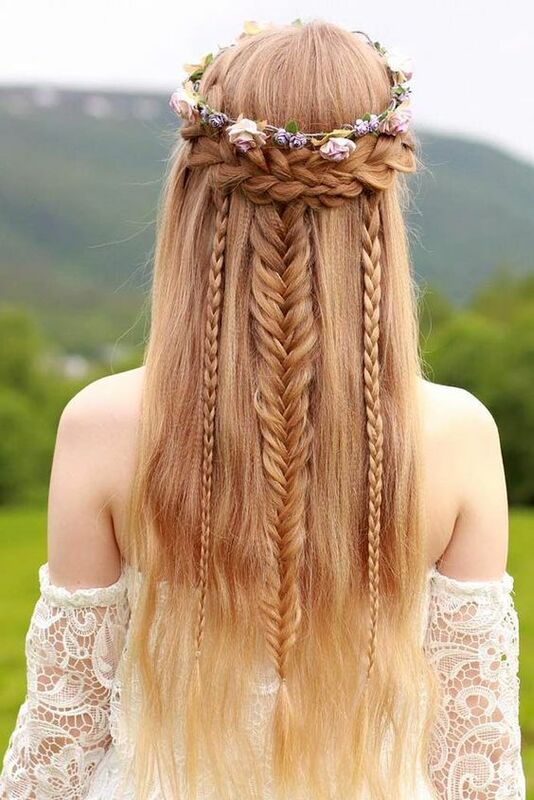 Extra-long hair is perfect for a dramatic braided hairstyle and this lovely waterfall design will always get you a second (and third) look! And the beautiful mix and match of soft beige-blonde highlights truly brings the asymmetrical plait to life! The colorist has used deep brown roots as the background to vertical highlights moving up to pale ivory-blonde. This creates amazing color patterns and the contrast helps make hair look thicker, too. City style is always at the cutting-edge of hair-fashion and this ultra-chic, gray braid hairstyle is perfect for glitzy social evenings! The asymmetric braid is full of texture created by a wide-link, herring-bone fishtail spread out to adorn the back. And the central, low ponytail has a light-blonde strand to cover the fastener decoratively. The expert colorist has used graphite-gray on the roots, with a pretty shade of light-ash-blonde (with pink/beige tones), for the ombré. And as you can see, this inspired color combo turns an already trendy braided style into a total scene-stealer! The model’s natural mousey, light-gray-brown color is no longer something to cover up! Soft greige is one of the season’s favorite shades, and it’s brightened by a lovely, mid-golden-blonde ombré. The stylist has created trendy faux-hawk texture and volume on top, before the braid begins at the crown. Two tightly plaited braids decorate one side and back, adding even more asymmetry to an amazing, loose, low side-braid! This ultra-romantic hairstyle, with a dainty flower circlet, is one of the cutest braided hairstyles ever! As a bridal braid hairstyle, it’s just perfect for an informal wedding – in summer or abroad on a sunlit beach. The clever colorist has added subtle blonde highlights in strawberry-blonde, which add 3-D color depth and patterns in the braiding. With just a touch of crimping, this is a gorgeous party hairstyle that’s full of fabulous texture and wavy movement! You can see that an expert colorist has helped create this wonderful, new, braid hairstyle! They’ve added bright blonde touches on the braid in exactly the best spots to mimic the look of reflected light! And fine, vertical highlights, in shades of beige and gold, transform a simple, low ponytail into a gleaming bronde fashion-feature. This big, beautiful braid creates super 3-D texture by increasing in size down to the nape. And there’s lots more texture in the criss-crossed side strands! As this is such a popular new braided hairstyle, I thought you’d like some guidance on how to do it at home! The loosely braided plait helps add the impression of thicker hair and dark roots accentuate the fab textures. And you can see how human hair extensions give the length and density we all wish we had naturally, too. Taken back from the face leaves the forehead bare, but the teasing gives height on top that’s flattering to round faces. Some special occasion hairstyles are so artistic and full of fashion flair, they deserve to be in an art gallery! This talented stylist has chosen a symmetrical design, which is perfectly presented in various shades of gray. The dark gray roots move through mid-gray shades with just a hint of beige to soften the look. And the super center braid with ‘pulled out’ sections, stands-out beautifully in pale ash-blonde! Here’s another style that you can easily ‘fake’ by clipping in a cute, ponytail hair-piece! It’s a fabulous style for a party or other semi-formal event, and looks great with a sundress or a backless evening gown. There’s lots of style and texture in the sides, as dark roots and wheat-blonde balayage accentuate the braiding. Extra height on top is good for lengthening your face shape. And who doesn’t enjoy the convenience of clipping in a swishy ponytail every now and again! 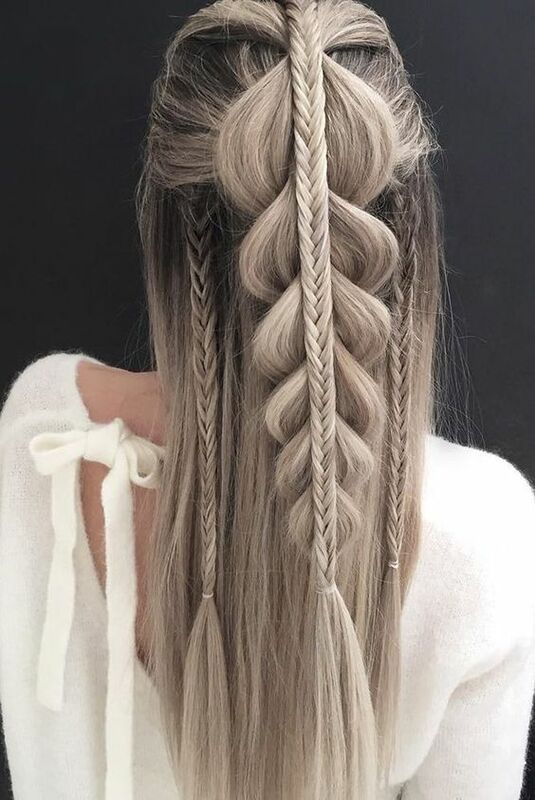 The popularity of various shades of gray has encouraged clever stylists to design some spectacular ‘big’ braid hairstyles! And styles that may have seemed ‘over-the-top’ in multi-toned blonde or copper hair colors, look just stunning in ‘black and white’! There’s no doubt that if you stand next to this model at a dinner-dance, you’ll instantly feel that you’re hair or gown is too bright! 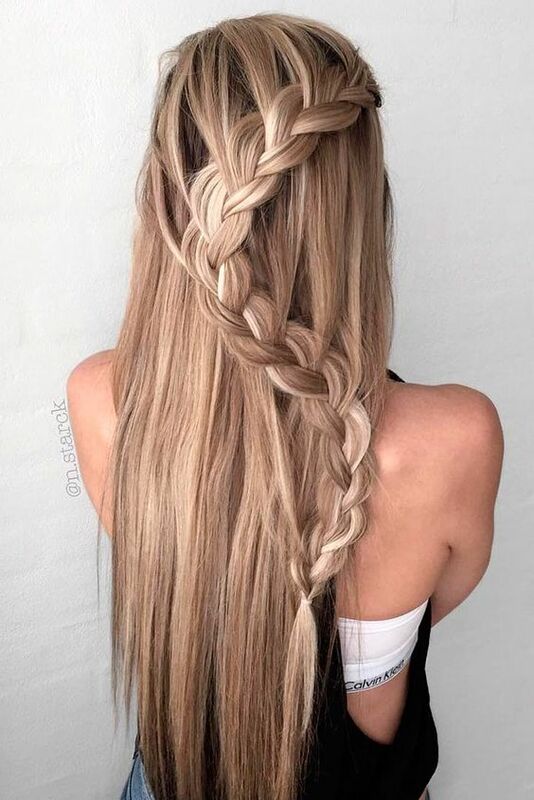 This magnificent triple loop and braid hairstyle is designed to hog all the attention, in a sophisticated blonde-bombshell look!